This is a new product from Kao, Biore Makeup Remover for Eye and Lip. It comes in an eye-catching pink bottle. It is said to contain Micro Cleansing Formula which softens and effectively lifts off all traces of heavily-layered makeup. This special formula works by giving more even dispersion when shaken, hence less wiping is needed on delicate eyes and lips where excessive wiping and tugging a these delicate areas can damage the skin, causing wrinkles. This formula also has the famous Hyaluronic Acid in their formula to moisturise skin as it cleanses. It is dernatologically and ophtalmogically tested to be safe on skin, yes and lips. 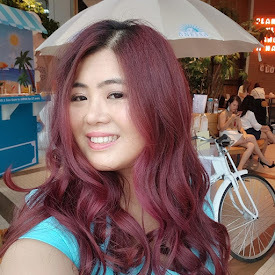 It promises to let the user easy to use, feels pleasanetly light and leaves no oily residue. You gotta shake the bottle well until the it turned to light pink colour before using it. 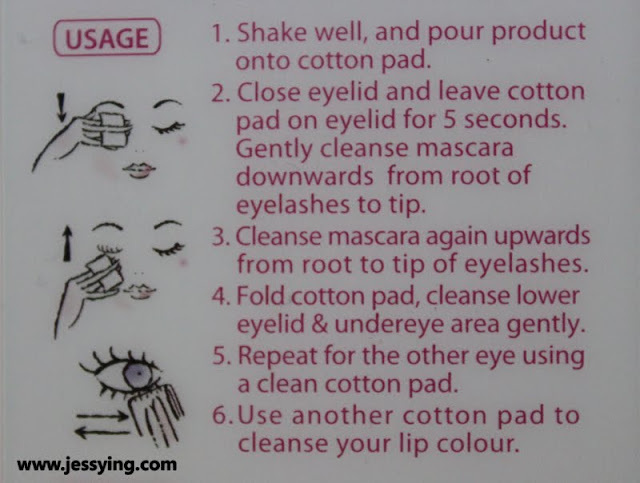 Close your eyelid and leave the cotton pad for at least 5 seconds. You can see that some of the mascara and eyeshadow melted after then 5 seconds wait. 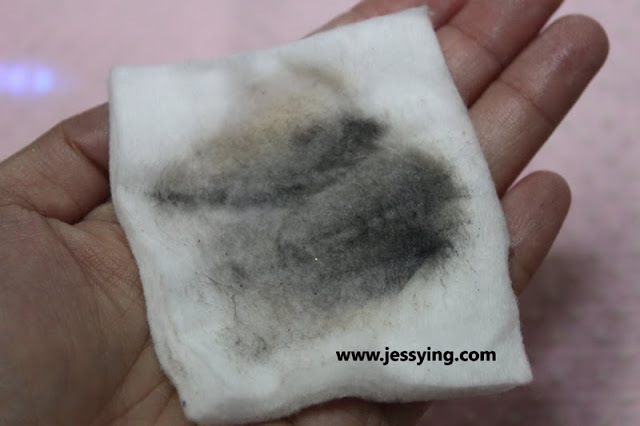 It is important to do this step as the makeup will be melted and it can be removed with a few gentle swipes. To remove your mascara : Slowly cleanse the mascara by gently swipping the cotton pad downwards from the root of the eyelash to the tip. 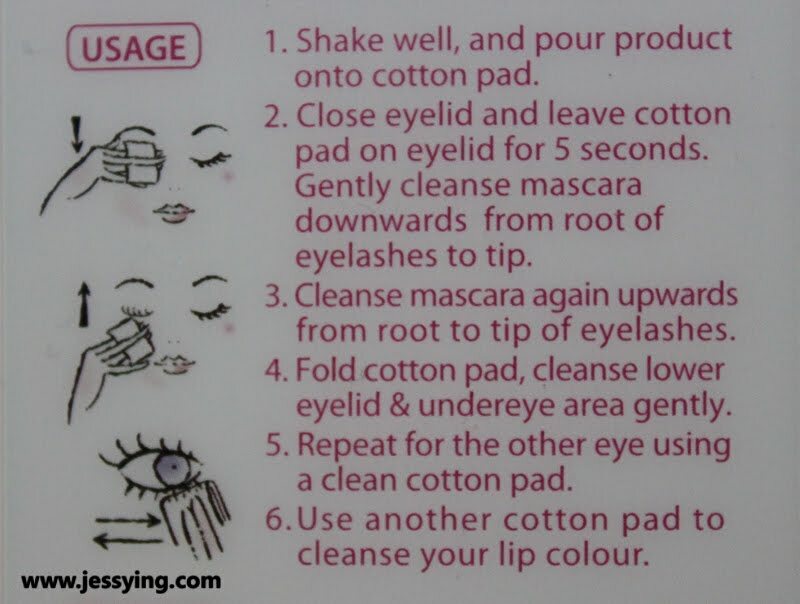 Cleanse the mascara again by moving upwards fromm root to the tip of eyelashes. Repeat a few times until it is clean. 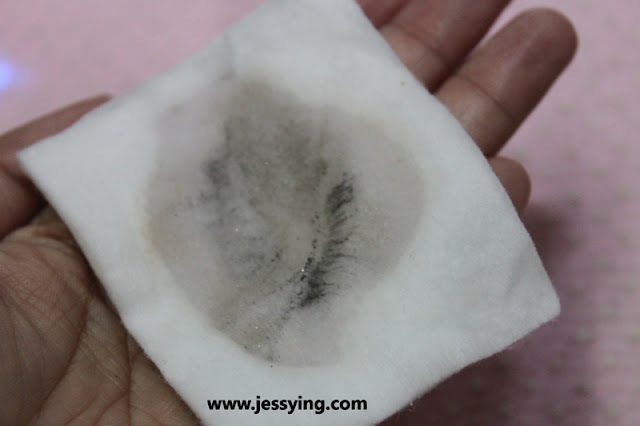 To remove the under eyeliner or eyeshadow and concealer, fold the cotton pad into half and gently swipes from left to right. Note : This is also a lip remover, hence just rememeber to leave the cotton pad with remover for 5 seconds on your lips before gently swipping it off. My review : It does pretty a good job cleansing up all my eyes makeup very well and easy including the stubborn mascara such as Max Factor. Seems like a few gentle swipes seems to be sufficient in removing makeup and it is does not leave oily residue after I washing off my face! I am in love with this remover simply because it does not sting my eyes although my eyes are quite sensitive. 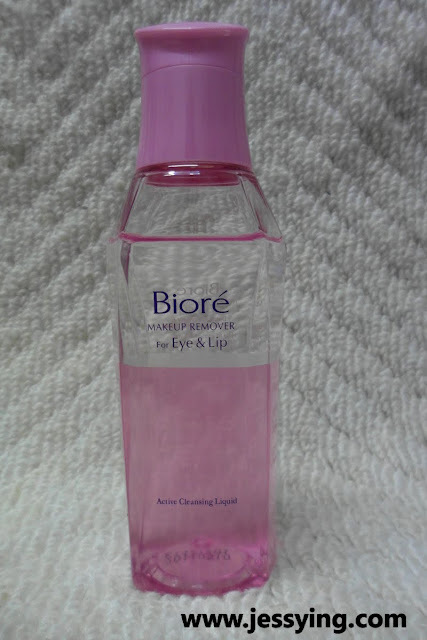 I pair this remover with my favourite Biore Cleansing Oil - in cotton wipes which I use to removed my face makeup and seems like a perfect combination! Definitely will re-purchased this! Biore Makeup Remover for Eye and Lip comes in 130ml priced at RM29.90. It is available exclusively at AEON Wellness, Caring Pharmacy, Guardian, Jusco, Sasa and Watsons. p/s: Stay tune! Because there will be a mini giveaway of samples to try on this !!! this is the best :) know that xiaxue is using this too! This only seems to be available in Asia - will check it out when I'm in Japan! 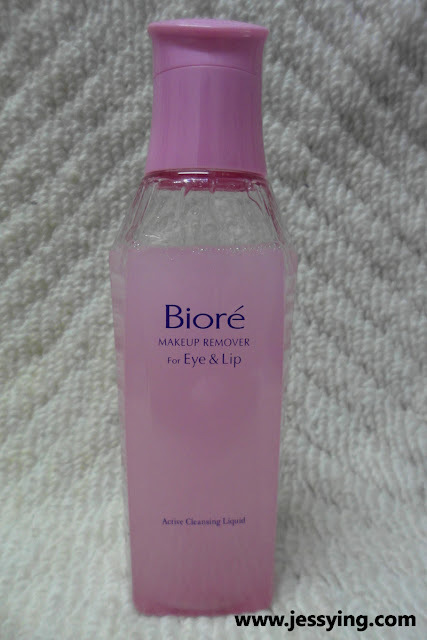 Biore Makeup Remover for Eye and Lip without oily feeling, great!